Late? Yes, but oh so ON TIME. Take a journey with Adam and Dollar Bin North into a world like no other. This week in our supersized (Adam to lazy to break into two shows) adventure we discuss black men in/and comics. 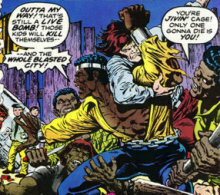 What’s it like to be black in comics? Take a listen an find out.